Our good friend Jo Lister is hosting a sing-along screening of the iconic movie, Grease, at The Palace Theatre in Newark on Friday 24 January. “I will be completely out of my comfort zone, and living in a way which, as a working mum of two is alien to me! No showers, toilets, or king size beds. No husbands to do the difficult or less desirable jobs and no children to raise your spirits. Trekking 120km in the Arctic Circle in temperatures ranging from 0 to -20 degrees Celsius (possibly minus 35 at night) over frozen lakes, camping in tents and dragging all my worldly possessions in a sled behind me. Along the way we will ski over numerous frozen lakes including ‘Lesjav’ri,’ which is over seven miles across. In good weather, we will see the beauty of protracted sunrises and sunsets. The effect of the pink light on the scenery can be stunning. Daylight will not be at a premium and therefore some travel may be necessary by torchlight. On clear evenings, one can expect superb displays from the Northern Lights, because Finnmark is regarded as the finest place in Europe from where to view them. The final part of our journey descends through the tree line of the Boreal Forest, to a frozen river valley, which we follow into Karasjok. We will then be transported back to our chalet for a celebratory meal and our flight home. Wow! ‘Challenge‘ sounds like a bit of an understatement, don’t you think?! 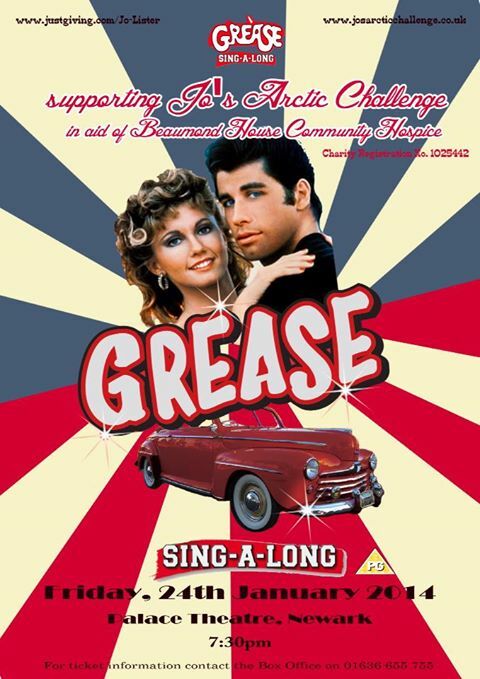 The Grease screening is the last push of Jo’s fundraising effort and tickets are going fast. They’re free but a donation of at least £5 per person would be, in Jo’s words, much appreciated. Just before Christmas, over 200 seats had already been booked (yes, the Girls Around Town are going – wouldn’t miss it for the world!) – if you want to join the party, call the Palace booking office on 01636 655755. The film starts at 7.30pm – see you in the bar around 7pm!! < The point of no return?